This article is about the Chrysler 200. For other uses, see 200 (disambiguation). The Chrysler 200 is a five-passenger mid-sized automobile that was manufactured and marketed by Chrysler from model years 2011 to 2017 across two generations in four-door sedan and two-door convertible (first generation only) body styles. The 200 nameplate debuted on the 200C, a prototype hybrid vehicle shown at the 2009 North American International Auto Show in Detroit and based on the Chrysler 300. The 200C concept was engineered to accept either traditional gasoline, hybrid or full-electric powertrains. The first generation Chrysler 200 was a restyled, rebadged and re-engineered version of the third generation Chrysler Sebring that began production in 2006. Although the JS platform had been retained, there were many cosmetic and powertrain changes to the 200. The 2.4 L four-cylinder 173 hp (129 kW) 166 lb⋅ft (225 N⋅m) engine with either a four-speed or six-speed automatic transmission carried over. Chrysler's new Pentastar 3.6 L V6 engine was also offered with a six-speed automatic transmission, generating 283 hp (211 kW) and 260 lb⋅ft (353 N⋅m) of torque. A flex-fuel version of the 3.6 L Pentastar engine was also available. Other changes included stiffer body mounts, revised suspension geometry with a softer ride rate, a new rear sway bar, and upgraded tires. The 200 was also more highly equipped than the Sebring. Chrysler added features such as LED lighting, thicker seat cushioning with higher quality materials, along with new measures to decrease noise, vibration, and harshness. The 200 and its platform mate, the Dodge Avenger, were ranked the "Most American Made" sedans and convertibles by The Kogod Made in America Auto Index in 2013. According to Edmunds' Acevedot, "by changing the name, Chrysler was able to let its midsize offering ride the coattails of the Chrysler 300 and to encourage consumers to think of the 200 as the younger brother of the flagship 300"; as an all-new generation of the 300 was released at the same time. Acevedot also noted that the name change has the added benefit of distancing itself from its predecessor, a vehicle notorious for quality issues and fleet pervasiveness. In early 2013, Chrysler CEO Sergio Marchionne announced that the first generation model will be short lived and a redesigned next generation model would appear in auto shows January 2014. The 2013 Chrysler 200 Convertible featured revised suspensions. Prior to the 2013 model year, the suspension on convertibles was largely shared with the Sebring that preceded it. The softtop convertible now matches the sedan's revised suspension. The retractable-hardtop could not fully accommodate the changes because the stiffer suspension would have made the ride too harsh. The retractable-hardtop version was also updated to the steering rack and rear toe link that the softtop received. In 2013 the S trim was removed and became two appearance options, S Interior and S Exterior options - that could be added to other 200 models. 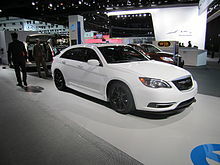 The two exceptions to this was the 200 S Special Edition and 200 Super S.
Mid-year in the 2013 model year, Chrysler unveiled the 2013.5 Chrysler 200 S Special Edition, made in conjunction with Carhartt. It was offered in sedan form only, and had a suggested retail price of $28,870. The car featured unique Mopar parts and suspension that were not offered previously, which lowered the car and stiffened the suspension. It also featured custom Carhartt embroidery atop the most premium interior options for the 200. The 200 S Special Edition evolved into the 200 Super S the following year, with additional performance improvements. The limited edition 2014 Chrysler 200 Super S was a Mopar modified version and included two stages. Stage One enhancements up front include a chin spoiler, mesh upper and lower grilles with the upper grille finished in gloss black, and satin chrome grille and fog light trim. Side sills and gray or hyper black 18-inch wheels give a firmly planted look, while black chrome badges and satin chrome side molding further differentiate the Super S. In back, more satin chrome finishes the light bar, and a new trunk lid spoiler and a matte black diffuser with integrated exhaust complete the package. Stage Two enhancements are mechanical. A cold-air intake is fitted under the hood while a cat-back exhaust replaces the stock setup. Finally, a coil-over suspension implemented at the corners results in a lower ride height and a lower center of gravity. In Europe between 2012 and 2014, the 200 Convertible was rebranded and marketed under the Italian Lancia marque. The Lancia Flavia was only available in left-hand drive markets, and was not sold in the United Kingdom or Ireland. Chrysler discontinued exports in September 2013. The 2015 model year Chrysler 200 debuted on January 13, 2014 at the 2014 North American International Auto Show in Detroit, Michigan. Based on the Fiat Compact platform, FCA (Fiat Chrysler Automobiles) used the long wheelbase version dubbed CUSW (Compact US Wide) for the second generation Chrysler 200. It is offered in four trim levels, LX, Limited, S as well as C — and is positioned as a mid-size entry intended to compete with Toyota Camry, Nissan Altima, Honda Accord, Mazda6, Volkswagen Passat, Chevrolet Malibu, and Ford Fusion. Becoming available in mid-2014 as an early 2015 Model Year vehicle, the second generation debuted at the 2014 North American International Auto Show in Detroit, Michigan, and became available in dealership showrooms shortly after. The second-generation 200 also had the best V6 horsepower the lowest drag-coefficient, and was the first car in its segment to have a dial-based gear shift. The second generation is only offered in sedan form. Chrysler noted the declining demand for convertibles, and high costs to create a convertible version using the all-new platforms, as reasons for not offering a convertible version. At its launch, the 200 was available in base LX, Limited, sporty 200S, and top-of-the-range 200C trim levels. Midway through the 2016 model year, new Touring, Limited Platinum, and 200C Platinum trims were added in place of the previous Limited and 200C. The 200 continued in production at Sterling Heights Assembly with the plant's paint shop received upgrades to facilitate production. 2015 Chrysler 200 production assembly began in May 2014, a month prior to going on sale. The vehicle had a base price of $21,700 excluding a $995 destination charge. The 200 is equipped with either a 2.4 L TigerShark (184-hp and 173-lb ft) or 3.6 L Pentastar engine (295-hp and 262-lb ft) both matched to a 9-speed automatic transmission. An all wheel drive system is available with the 3.6 L engine, including a fully disconnecting rear drive axle to improve fuel efficiency. The system detects adverse road conditions and engages, sending power to all 4 wheels. The system disengages when increased traction is no longer needed. The 200 would also offer a stop/start system to aid fuel efficiency with the 2.4 L TigerShark engine. Uconnect systems: Bluetooth streaming audio, Uconnect voice command and Bluetooth (with Uconnect access). The 8.4AN System adds navigation, featuring full-color 3-D graphics and HD Radio. Technology features include a 7-inch LED screen full color instrument cluster, standard electronic rotary dial replacing the console shifter, push button start, an available 8.4 inch Uconnect(TM) touch screen and a hands off the steering wheel automated parking system. An open pass through center console provides storage. An Alpine 9 speaker and subwoofer system as well as a dual panoramic sunroof are available options on 200S and 200C trims while Limited trims are available with a traditional single panel sunroof. After its first year in production, Fiat Chrysler Automobiles CEO Sergio Marchionne said the Chrysler 200 would "run its course" under the current Compact US Wide architecture, pointing to the car being discontinued. While in his initial announcement of this news, he criticized the car's rear-door entry - some have argued this may not be due to the car's quality or success - particularly as the second-generation Chrysler 200 has been a high volume seller for FCA. Instead, more evidence points to FCA's stronger sales in trucks and SUVs being a primary reason for discontinuation. FCA also discontinued the Dodge Dart, FCA's other CUSW car - while maintaining production of the Jeep Cherokee SUV, and Chrysler Pacifica minivan, which are mechanically similar to the Chrysler 200, share a platform and many parts. Marchionne had said that he would be willing to continue production of the Chrysler 200, if another automaker continued it - though he did not specify if he was seeking another manufacturer to produce the 200 as-is, or as a captive import of another vehicle. Either solution would not impact FCA's CAFE margins, thus allowing it to continue selling the cars while existing as primarily a truck manufacturer in the United States. On July 26, 2016, FCA announced that Chrysler 200 production at the Sterling Heights plant would end in December 2016. After a short run as a 2017 model, production of the Chrysler 200 ended on December 2, 2016. At the 2017 Detroit Auto Show, Marchionne explained the decision to end production, and not offer a replacement for the US or Canada: "I can tell you right now that both the Chrysler 200 and the Dodge Dart, as great products as they were, were the least financially rewarding enterprises that we've carried out inside FCA in the last eight years," adding "I don't know one investment that was as bad as these two were." This strategy positions FCA in the US as largely a manufacturer of SUVs and trucks. The company had to find additional capacity for Jeep and Ram. FCA plans to move production of its Ram pickup to Sterling Heights. For Super Bowl XLV, Chrysler purchased a 2-minute-long advertisement featuring Eminem with the motto Imported from Detroit. Chrysler was thinking about using the Chrysler 300 in the advertisement, since it had a higher retail price than the 200 and also enjoyed better press-reviews, but quickly rejected the idea since the 300 is not manufactured in the United States, but in Ontario, Canada and would not fit the company's new branding. This commercial enjoyed great popularity among viewers, with the term "Chrysler 200" being the second most-searched term on Google the day after the Super Bowl and search traffic for the vehicle going up by 685 percent on AOL Autos. Shortly after being uploaded to YouTube after the Super Bowl, the ad quickly received over 5 million views. The Chrysler 200 also featured heavily in the London-based 24: Live Another Day spinoff series of 24. This is despite the fact that the vehicle was never sold in the UK. A legally required front numberplate is not present, the rear numberplate details are for a Ford Mondeo. ^ "2015 Chrysler 200". www.fueleconomy.gov. United States Department of Energy. Retrieved April 21, 2014. ^ "The Chrysler 200C concept car". Allpar.com. Retrieved 16 March 2015. ^ Patrascu, Daniel (7 December 2010). "Chrysler 200, Dodge Avenger Enter Production". Autoevolution. Retrieved 16 March 2015. ^ "2013 Chrysler 200 Features and Specs". Edmunds.com. 10 March 2010. Retrieved 6 January 2014. ^ Nagy, Chris (13 October 2010). 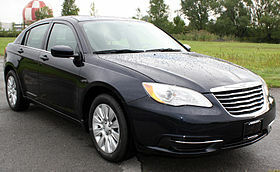 "Chrysler Adds 200 Sedan for 2011". Automoblog.net. Retrieved 19 December 2015. ^ "Chrysler officially replaces Sebring with 2011 200 sedan". Leftlanenews.com. Retrieved 19 December 2015. ^ "The new Chrysler 200 Drops its Top – Introducing the 2011 Chrysler 200 Convertible" (Press release). media.fcanorthamerica. 11 January 2011. Retrieved 19 December 2015. ^ "New Auto Index Redefines "American Made" Cars". Hogod Now. 2013. Retrieved 19 December 2015. ^ "How Chrysler keeps killing it - Chrysler 200 (4)". Money.cnn. 10 November 2011. Archived from the original on 12 November 2011. Retrieved 19 December 2015. ^ Bowman, Zach (18 March 2013). "Chrysler 200 replacement coming in January". autoblog. Retrieved 19 December 2015. ^ a b Sabatini, Jeff (November 2012). "2013 Chrysler 200 Convertible V-6 - Instrumented Test". Car and Driver. Retrieved 5 May 2018. ^ "Legendary Detroit Companies Carhartt and Chrysler Team Up to Introduce a Car that Personifies Hard Work and Rugged Perseverance – the 2013.5 Chrysler 200 S Special Edition Mid-size Sedan". Carhartt MediaRoom. Retrieved 5 July 2017. ^ "Chrysler 200 to be Lancia Flavia in Europe". Inautonews.com. 17 January 2011. Retrieved 19 December 2015. ^ "2013 Chrysler 200 4 DR FWD". Safercar.gov. Retrieved 19 December 2015. ^ Yarkony, Jonathan (25 February 2014). "Interview: Jeff Hammoud, Chrysler 200 Lead Exterior Designer". Autos Canada. Retrieved 16 March 2015. ^ "All-New 2015 Chrysler 200: On the Road with America's Import". FCA US LLC. 29 April 2014. Retrieved 16 March 2015. ^ Garrettjan, Jerry (13 January 2014). "The Chrysler 200 Gets a Reboot". The New York Times. Retrieved 6 January 2014. ^ Visnic, Bill (12 January 2014). "2014 Detroit Auto Show: 2015 Chrysler 200". Edmunds.com. Retrieved 6 January 2014. ^ "Chrysler 200 Homepage". Chrysler.com. FCA USA LLC. Retrieved 24 July 2016. ^ Giles, Ralph. "FCA Executive, Chief of SRT Division". Instagram. ^ Joseph, Noah (23 February 2014). "Chrysler killing off 200 Convertible, Dodge Avenger". Autoblog.com. Retrieved 19 December 2015. ^ Keegan, Matt (21 October 2014). "No Coupe or Convertible for Chrysler". Autotrends.org. Retrieved 19 December 2015. ^ Snavely, Brent (16 July 2013). "Chrysler's new Sterling Heights paint shop will open in early". Detroit Free Press. Retrieved 6 January 2014. ^ "New 2015 Chrysler 200 pricing, details and specifications". Autoweek. 16 January 2014. Archived from the original on 19 January 2014. Retrieved 19 December 2015. ^ Goodwin, Antuan (13 January 2014). "The 'most improved' car at the Detroit auto show is the redesigned 2015 Chrysler 200". CNET Reviews. Archived from the original on 16 January 2014. Retrieved 19 December 2015. ^ Wayland, Michael (1 December 2016). "Chrysler 200 production ends Friday in Sterling Heights". Detroit News. Retrieved 5 July 2017. 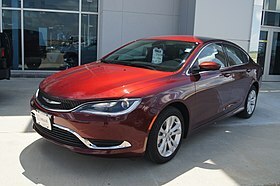 ^ "2017 Chrysler 200 4 DR FWD". Safercar.gov. Retrieved 23 November 2016. ^ "Vehicle details". Iihs.org. Retrieved 10 December 2015. ^ Voelcker, John (10 February 2016). "Will Tighter CAFE Rules Bring More Trucks, Fewer Small Cars?". Green Car Reports. Retrieved 5 July 2017. ^ McEachern, Sam (15 July 2016). "Dodge Dart To Be Discontinued In September". Fiat Chrysler Authority. Retrieved 5 July 2017. ^ Price, Christopher (12 July 2016). "Dear Mitsubishi, FCA – Please Revive Diamond-Star Motors / DSM". christopherprice.net. Retrieved 5 July 2017. ^ "FCA earmarks $1.5 billion to build Ram 1500 pickups at Chrysler 200 plant". Automotive News. Crain Communications, Inc. Retrieved 26 July 2016. ^ FCA moves Ram production to Mich. The Detroit News. Retrieved March 23, 2018. ^ Woods, Ashley C. (23 December 2011). "'Born of Fire' Chrysler 200 ad featuring Eminem was simply the best of 2011". mlive.com. Retrieved 19 December 2015. ^ "The Inside Story: Chrysler's Risky Eminem Super Bowl Commercial". Autoblog.com. Retrieved 8 February 2011. ^ "Bauer Drives Chrysler 200 In Fox's '24: Live Another Day'". MediaPost.com. Retrieved 22 August 2016. ^ "2015 Chrysler 200 [UF] in 24: Live Another Day, TV Series, 2014 IMDB Ep. 1.07 - Comment1924257". IMCDB.org / user 'dsl'. Retrieved 22 August 2016. ^ a b Zatz, David (4 January 2012). "Chrysler Sales Shoot Up 37% (26% for 2011)". Allpar.com. Retrieved 19 December 2015. ^ "Chrysler Canada Finishes Year with Best Retail Sales Since 2002" (Press release). media.fcanorthamerica. 4 January 2012. Retrieved 19 December 2015. ^ "Sales of Fiat-Chrysler in Canada 2012-2011-2010 - Vendite di auto FCA in Canada". www.carsitaly.net. Retrieved 5 July 2017. ^ "AMDA Mex (Industria Automotriz 2008-2013.pdf)" (PDF). Retrieved 5 July 2017. ^ "Chrysler Group LLC Reports December 2012 U.S. Sales Increased 10 Percent – Strongest December Sales in Five Years; Full-Year Sales Up 21 Percent – Strongest Annual Sales Since 2007" (Press release). media.fcanorthamerica. 3 January 2013. Retrieved 19 December 2015. ^ "Chrysler Canada Finishes Year With Best Retail Sales Year Since 2000" (Press release). media.fcanorthamerica. 3 January 2013. Retrieved 19 December 2015. ^ "Chrysler Group LLC Reports December 2013 U.S. Sales Increased 6 Percent – Best December Sales in Six Years; Full-Year Sales Up 9 Percent – Strongest Annual Sales Since 2007" (Press release). media.fcanorthamerica. 3 January 2014. Retrieved 19 December 2015. ^ "FCA US LLC Reports December 2014 U.S. Sales Increased 20 Percent – Best December Sales in a Decade; Full-Year Sales Up 16 Percent – Strongest Annual Sales Since 2006" (PDF) (Press release). FCA US LLC. 5 January 2015. Retrieved 19 December 2015. ^ "Chrysler de México Reporta Ventas de 7,294 unidades durante octubre". Chryslerde Mexico (Press release). 1 November 2014. Retrieved 5 July 2017. ^ "FCA US LLC Reports December 2015 U.S. Sales Increased 13 Percent" (PDF) (Press release). FCA US LLC. 5 January 2016. Retrieved 7 January 2016. ^ "Pone FCA fin a producción del Dodge Dart y Chrysler 200". Alvolante. 1 September 2016. Retrieved 5 July 2017. Wikimedia Commons has media related to Chrysler 200.